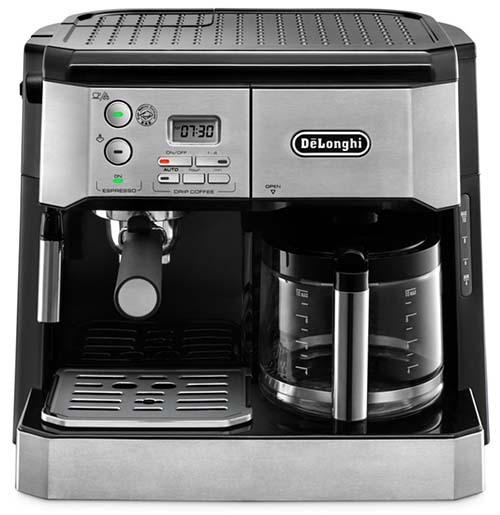 An excellent combination coffee machine, ideal for home use, and an excellent pick for those with limited space. 1.8 A Cup Warming Tray, Too! Are you new to the world of specialty coffee drinks? Are you on a budget, and looking for a machine​​​​ that can offer you a taste of both, giving you a pot of steaming coffee on demand, while also giving you all the tools you need to let your inner Barista out to play? 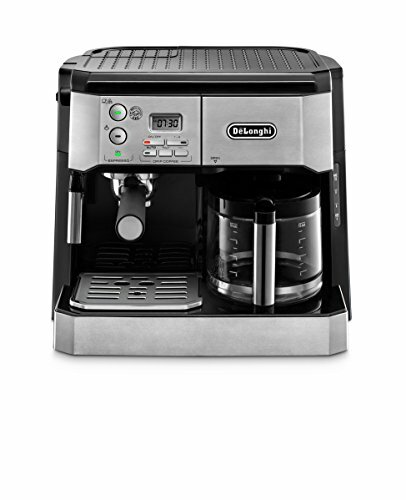 If so, then you’re going to love the DeLonghi BCO430 combination coffee machine! It’s an interesting model that, in our view, does a great job of providing you the best of both worlds. 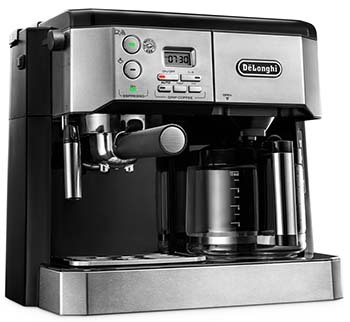 We should warn you right up front that it’s by no means a perfect machine, although our view is that too many online DeLonghi BCO 430 reviews wind up not giving it enough credit. Sure, it has its shortcomings, and we’ll cover all of its strengths and weaknesses in the sections below. Shortcomings aside, for the right user, this machine could be a dream come true! Let’s get right to it and see what makes this model tick. There are two things to note about this machine before we dig more deeply into its feature set. First, it is a combination unit, but it only has a single boiler (this, in a bid to keep its cost down). That means you can’t brew coffee while you’re making an espresso or vice versa. That’s not a deal breaker, but it is something to be mindful of. Second, this is not a super-automatic machine, because it has no grinder. It’s not a full “beans to brew” system, but rather, would be classed as a semi-automatic. Again, that’s not a deal-breaker, but it’s something to keep in mind, so you know exactly what you’re getting. There’s a lot to like here. To start with, the BCO430 combination coffee machine has a modest footprint, with dimensions of 14.5” x 11” x 12.8,” and weighs in at just 14.2 pounds. Given that if you buy this machine, it will take up the space formerly occupied by your old Drip-Brew coffee maker, and won’t take up much more room than that, it’s easy to fit it into most home kitchens. It’s not an unattractive machine, but it’s obvious that the designers were more concerned with function over form. As such, it’s got clean, simple lines and an understated look. Being silver with black highlights, and constructed of sturdy ABS plastic, it has a relatively neutral appearance that will make it blend in well with most home kitchen décor. The front-loading water reservoir has a 40-ounce capacity. We readily admit that because we’re power drinkers, we have some bias against machines with smaller water tanks, but with the BCO 430 it’s not really noticeable, because while you’re brewing a specialty drink, you can be enjoying a cup of steaming drip-brew coffee courtesy of the “other side” of the machine. Even so, it’s something to make a note of, and if you have a large household with multiple coffee drinkers, then this unit’s smallish water tank will require regular refilling, which may be a strike against it. On the other hand, if you’re in a smaller household, or are a casual coffee drinker who just wants to be able to experiment, then this one is perfect! Note that the reservoir features a carbon filter, which virtually eliminates the need for descaling. We’re of two minds about the presence of the filter. We get why a lot of companies include them because reducing the amount of descaling saves you time where maintenance is concerned. Unfortunately, it also increases your total cost of ownership of the machine, since you’ve got to periodically buy replacement filters. If you decide to go without a filter, or not replace it when it’s time to, just be sure you’re using distilled water. That’ll give you the same basic benefits, no filter needed. One of the key things that differentiates super-automatic machines from semi-automatics is the fact that super-automatics are true “bean to brew” systems. You load beans into a hopper, select the kind of drink you want, push a button, and wait. That’s not the case here. That’s just not what this machine is. There are a few things you’ll have to do manually. If you’re okay with that, and if you regard it as being an excellent way to hone your “Mad Barista Skillz,” while still being able to enjoy a “regular” cup of Joe when you want one, then this machine will be a dream come true for you. There are two ways to get around the absence of an integrated grinder. You can either use pre-ground coffee (an idea which coffee purists will hate, but it might be the right answer for some), or you can buy a separate grinder. 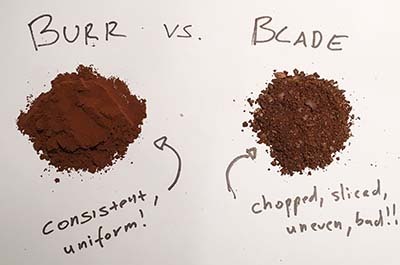 If you opt for a separate grinder, get a burr grinder, rather than a blade grinder. Bladed grinders don’t grind your beans so much as smash them into tiny bits. The result is that you don’t wind up with grounds of consistent size, which can impact the flavor of the drink you’re trying to make. If you decide to get a burr grinder, get a ceramic one, rather than stainless-steel. They cost a bit more, but ceramic grinders don’t heat when in use, and stainless-steel ones do. This can result in your grounds getting burnt, which will utterly ruin the flavor of your coffee. It’s best to just not go down that road if you can avoid it because exactly no one likes burnt, nasty tasting coffee! The lack of an integrated grinder may be a blessing in disguise for some people. The reason is that integrated grinders in super-automatics are universally bad at dealing with oily beans, requiring you to stick to Medium Roast beans for best results. But since you’ll be buying your own grinder, you can use whatever beans you want, opening up a world of possibilities those poor guys using super-automatics don’t have access to! 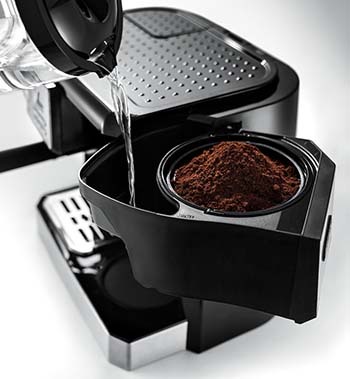 Note that the unit does come with a tamp, so you can tamp your grounds firmly in place when making espresso. The BC 0430 comes with a single aluminum, stainless-steel lined boiler. This essentially means that it can’t walk and chew gum at the same time. You can either brew a pot of coffee, make an espresso, or steam milk, but you can’t do any of those things simultaneously. That’s not a huge deal because it doesn’t take long for the boiler to shift gears and temperatures from one task to another, but again, something to be mindful of. The delays we’re talking about here are measured in seconds, not minutes, so it’s not going to set you back a lot either way, and the presence of just a single boiler is one of the keys to keeping the price of the unit down. After you tamp the grounds into the brewing receptacle, you place it into the slot on the machine and push the button. The bottom of the receptacle has two holes which allow the espresso to drain into your waiting cup, but there’s no way to height adjust its position. 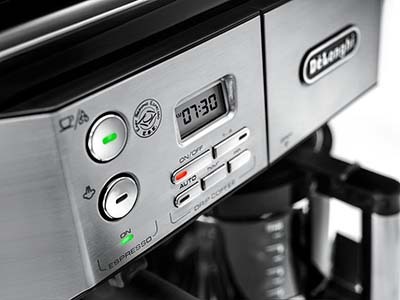 There’s not much to say about either of these things here in our DeLonghi BCO 430 review. The brew unit can’t be removed, so you’ll want to clean it periodically via a cleansing tablet, and the controls are no more complex than your average drip-brew coffee machine. It’s just that there are a couple of extra buttons and options. You can still set the clock, set the auto-shutoff time and the like, probably just like you’re doing now with your current drip-brew machine. Unlike your drip brew machine though, the espresso side of the unit comes with an impressive fifteen bar pump for making espresso. This brings us to an important point about the difference between how coffee is brewed and espresso is made. The right side of the machine, with the coffee pot, relies on simple gravity to soak the grounds and drip their way down into the waiting pot. On the espresso side, water is forced through the grounds under pressure, measured in bars. One bar of pressure is equal to atmospheric pressure at sea level, and it takes a minimum of nine bars to make a good espresso, so with this machine, you won’t have any problems on that front! This is another feature that will allow you to practice your Barista skills! Rather than coming with some kind of auto-frothing system, the BC 0430 puts you in full control of the amount of foam and steamed milk you get, and the quality of that foam, by including a frothing wand. To use it, simply turn the control knob to steam, wait for the light to come on, letting you know it’s ready, insert the wand into the milk, and froth to your heart’s content! Note that using a frothing wand well takes time and practice, so don’t be discouraged if your first few milk-based drinks don’t turn out quite as well as you’d expected. Just keep practicing, and you’ll be an Ace at it in no time. Honestly, that’s one of the main strengths of this unit. 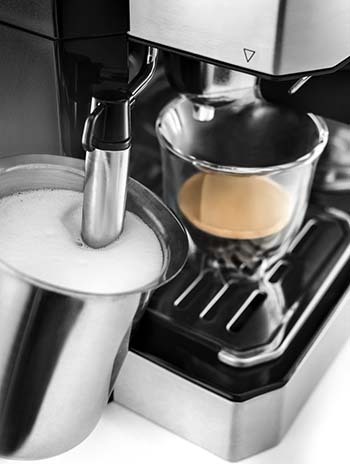 Espresso sits at the heart of most specialty coffee drinks and armed with a machine that can make great espresso and a frothing wand, you can make just about any specialty drink you’ve got a craving for. Sure, it’s a little more hands-on, but again, that’s just an excuse to let your inner Barista out to play! A Cup Warming Tray, Too! Believe it or not, this little gem even comes with a cup warming tray. You’ll note that the entire top surface is pebbled, to better hold the cups you place atop it. The tray is passively heated by the heat from the boiler, so it doesn’t get excessively hot, but it’s certainly enough to get the job done! Most specialty coffee drinks were meant to be enjoyed at a lower temperature than American coffee drinkers are used to. This is particularly the case of milk-based drinks, because milk has to be steamed at a lower temperature, and your finished product loses heat when the milk and coffee combine. Pour your drink into a cold cup, and you lose even more heat. Pre-warm the cup on the cup warming tray though, and you counteract that problem, retaining more heat in your drink. If you’re skeptical about that, try it both ways – you’ll be amazed at the difference it makes. The presence of the carbon filter virtually eliminates the need for descaling. Cleaning the brew unit is as simple as popping in a cleansing tablet at regular intervals. There’s no grinder to worry about keeping clean (although if you buy one separately, then obviously, there’s a bit of care involved on that front too). In other words, it’s no more of a challenge to keep this machine clean than it is the coffee maker you’re using right now, and the controls are simple too. 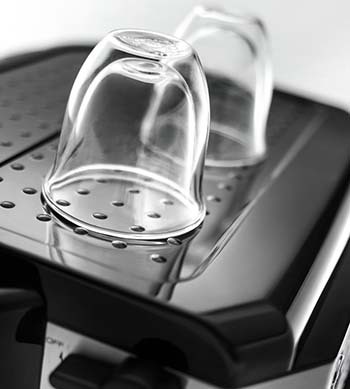 If you can use a drip-brew coffee maker, you can use this machine. There’s one knob and about four additional buttons to contend with, and that’s it. It honestly couldn’t get much easier than that. We don’t have anything to complain about where this machine is concerned. Correcting anything we’d list as a shortcoming would involve raising the price of the unit, which would move it away from being a value-priced offering, so we honestly feel that the machine is fine as is. Clearly, this model isn’t for everyone, but we feel that we have to part ways with many of the other DeLonghi BCO 430 reviews online and tell a slightly different story. If you’re looking for a one-touch system that does most of the work for you, you’re not going to like this model. If you only drink specialty drinks and have no interest in drip-brew coffee, you’re going to be equally underwhelmed, but both of those are self-selecting. People interested in one-touch systems, or who don’t like drip brew coffee would never consider this unit to begin with. For the rest of us, it’s an excellent little coffee machine, giving you all the tools you need to make any specialty coffee drink you can dream up, with a bit of effort on your part. While we wouldn’t personally buy one (too small for our liking, being power drinkers), it’s a great unit for the right person, or for a smaller household. Highly recommended for anyone who falls into that category, and who wants a taste of both worlds. The Last Coffee Grind Size Chart You’ll Ever Need. Home Grounds. Milk Frothing Guide - Frothing for Newbies & Intermediates. Coffee Geek. 7 Tips That Will Change the Way You Brew Coffee at Home. CNET.